I hope those of you who celebrated Mother's Day had a great time! We've now got graduations and then Father's Day and so it goes as we march race towards Christmas. I'd like to say I have a dozen new Christmas cards to show you, but alas and alack, I have been forgetting all about them. Slap! I have been making birthday cards, however, to plump up my always-needed stash. For this first OLC card, made espeshully for a challenge, I used NBUS Washi tape and applied the "less than 10 minutes" rule. I used two OBB stamps, which means "old but beloved." You know, like your grandma. The sarcastic humor of the sediment never fails to karack me up when I use it on a card. You may be seeing lots of QACAS Washi tape cards in my future posts. Mike had these unbelievably gorgeous boxes of Washi tape on sale from $25 to $9 and I couldn't resist. I chose b/w for this design, but the boxes also have tape in very bold patterns and stunning colors. Less Is More: One-layer card using spots and stripes. 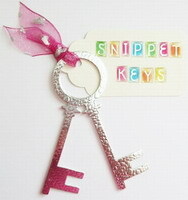 Sweet Stampers: Dots and/or stripes. It was a quick and fun way to use more die cuts from friends, stick-on winged critters, and lots of designer pp! A few of you want to know what I did with my purged stamps. 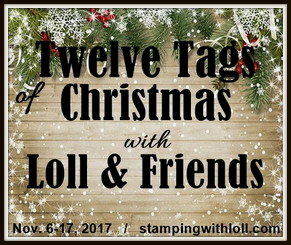 I'm happy to say that the clear stamps were divided up between bloggie friends and the wooden stamps were divided between two young kindergarten teachers and a bloggie friend who works with a senior group. I love the idea of having them used by new hands both young and old, rather than having them languish in my dark drawers. Everyone is happy! I love your black and white card with that fun tape from Mike (love that) you even made Oscar smile with that one! I too love that sentiment! Im so excited for tomorrow! Black and white is one of my favourite combos and I love the splash of colour from those balloons. Great sentiment too. Lovely photo of you and those handsome chaps ..... they're growing up so fast! Hi Darnell, Loving all your cards. Your grandsons look very smart. Is there anything nicer than black, white and a pop of red - I don't think so - your card is beautiful! And all those others too - wow, they all look amazing. You really did have a fun time with that die! Eine sehr schöne Karte. Vielen Dank für deine Teilnahme bei den Sweet Stampers. Love your QACAS black and white snarky card Darnell - a great sediment!! Well done on purging your stamps - I have yet to part with any of mine as I still use them all. Love how you used the washi tape. Haven't you been busy with an amazing array of cards! Your grandsons look so smart and a lovely photo for the album. Oh I love that sentiment! What a super array of cards! And I love that photo... Don't they grow up fast! It took me 50 years to grow up! Cute card and I love the sentiment!! I love that picture of you and the boys because your smiles are broad and just so happy! You have been busy! Sometimes a quick card is perfect and this looks so good. Love the black and white with that splash of colour. Your other cards look great..busy gal! Great black and white card. It fits right in to Indiana right now as this is race month and we think in black and white all month. Clothes, decorations and flags! The sentiment is so fun too. Wow, I'm so impressed with all the pretty cards you made with extra bits. I love the idea of young and old using your purged stamps. I have seen people in nursing homes doing crafts and it is so rewarding for them. This is a wonderful picture of you with the twins. We have had the opportunity to watch them grow up through your blog and they are such handsome young men. Love all your cards, Darnell. The photo is cute too. The boys are growing like weeds! What a beautiful CAS card Darnell. Haven't been to Michael's in a while...probably a good thing, since I can't resist a good deal! I LOVE Washi tape, but struggle to use it! I love what you've done with it here! And...one can never have too many birthday cards! I always love seeing the photos of you and the "boys." They certainly are growing up fast and before you know it they will be in high school. Yikes! I have a vast collection of Washis but if I saw that deal of course I would buy it at Mike's (love it). The sentiment is great. Love our card. The b/w is stunning. That sediment kracks me. up too. And I had to type that 3 times--spell check just would not let me say what I wanted. Great card to have in your stash for man or woman. 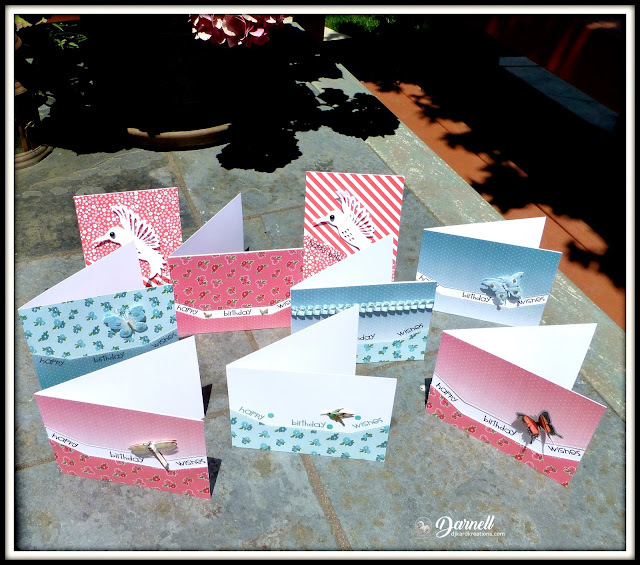 Lovely array of cute cards with the new angle die, theyare so colourful! Lovely smiling shot too, your nephew are two so beautiful boys! I can clearly see you haven't been idle. That black and white card is the bomb (yes, I know that turn of phrase is dated). That washi tape really served you well. Then to turn out all those sweet cards with you diecuts. Brilliant. Makes me feel like I'm sloughing off. Are those boys growing to fast, or is it just me (wider). Certainly are handsome, though. See a lot of you in them. Love your cards today (as usual). I too think the picture of you and the twins is wonderful. Aren't grandkids fun? Mine are all teenagers now with one driving. 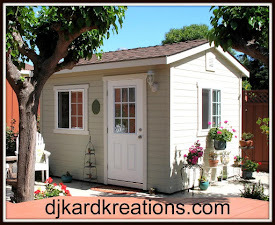 I am pleased you still have time to blog and always open yours first! Many hugs from MN! With cute washi like that, who needs a stamp ... but the balloons are really wonderful, and the sentiment says it all! Oh you do make me laugh, D.
I love the fresh and clean look of black and white and the pop of color is perfect.. Great picture of you and the twins. I love all of your cards my friend. But the birthday one using the Washi tape and that hilarious sentiment really caught my attention. I need to use more of my Washi tape I can see as I love that idea of yours. Wonderful cards! Such a fun photo!! WOW ! 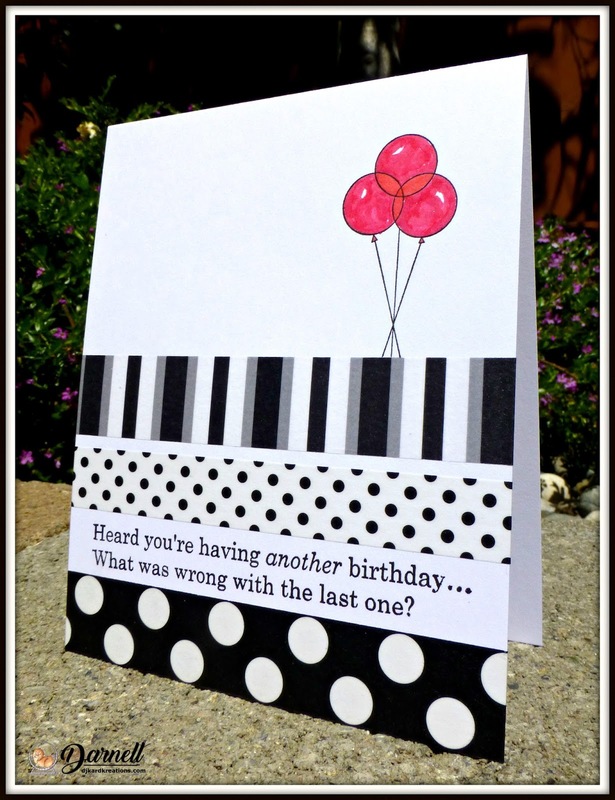 Your card is fabulous and so eye-catching with these b/w stripes and dots ! I love it ! But my favourite is the sentiment ! So funny ! So sorry that it cannot enter our challenge ! Anyway it is gorgeous as well as all the array of the other cards you made ! Love the picture of you with Henri and Adam, you look so great ! You have all the same eyes ! Thanks so much for sharing and for playing along with us at Less is More. Yep, I can certainly say that the sentiment karacked me up too, love the black and white with the touch of colour. Your other collection of cards look fantastic too, super colours. I also pass my stamps on to young, new crafters, not sure that their parents approve as it seems to make them want to buy more new stash as the 'bug' sets in even more. Super photo too, they seem to look very much like you, I think. Your card is really neat! Always like to see black and white..so elegant! I just purchased some washi tape on sale (so now I have a collection of three...smile...and they have been sitting in my craft room as NBUS. You have inspired me to get them out and try them...smile. Love your cards, Darnel, especially the b/w card. Completely caught my attention when I saw your e-mail post in my inbox. How wonderful of you to donate your much loved supplies. That's a great idea. And such a sweet Mother's Day photo. Looked like a super nice day. I love this birthday sentiment! 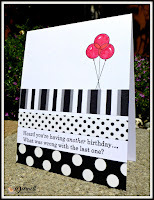 What a fun card with the Washi tape and balloons! And a bevy of fun cards using the die cuts etc.! Henry & Adam are growing into very handsome young men and Nana's smile shows how much you enjoy them! What a wonderful photo of you and your grandchildren! And what a nice stash of birthday cards you've created. I need to do the same! I love your black and white washi tape designed 10 minute card, Darnell. Fun seeing all your angled die cut cards..that is a lot of very productive stamping my friend. Great photo of you and the boys too :-) TFS all..hugs.. Ooohhhh!!!! That birthday card is fabulous! Love that snarky sentiment. Great sentiment and you rock washi well. Awesome cards! Love the B & W washi - totally fun! The angled die is sooooooo cool! Sure beats hand cutting! Loving the DP's. Twinks and Granma picture steal the show in this post! Those two fellows are soooooo darn cute! Their hair is AMAZING!!! Grandma is looking mighty hot too! Oh, I especially love the black and white with the pop of color from the balloons. Hilarious sentiment! And look at all those extras ready to go! You and the grands make a mighty good lookin' picture, too! what wonderful cards and their designs are super and gorgeous. Love the stamped sentiment on your dots and stipes card. All those wonderful other creations are fab and I do like that unusual die. Super photos of the young men I can see the family resemblance. Love and big crafty hugs from my house to yours. That sentiment just cracks me up so much. In fact I love it and your card so much that I think I'll have another birthday just so you can send it to me! Beautiful cards Darnell. Love the first one! The NBUS cards are lovely. Nice pic of you and the boys. Best sentiment! And a classy design to go with it. Great sentiment--love it! And your classy black & white is wonderful! So happy that you had a wonderful Mother's Day with a visit from the grands. Such a sweet picture of you & your grandsons, Darnell! Love the Washi tape BD card--such a fun sentiment! Wow--you were really on a roll making all those beautiful cards with the printed paper & fun die cut edge! Oh wow! Love that washi tape card. Great use for the stuff that seems to go on forever. :) I also really like your designer paper card. Great way to make several cards quickly. A lesson I need to embrace more often! Your grandsons are so handsome and look at that super happy beautiful grandmother, too! Hugs! Love, love, love this. Looks very schik in black and white. Haven't tried washi tape. Don't see much of it about here but did see something about stamping patterns on masking tape. Did wonder who this fella "Mike" is and why he's been tempting you with his wares. Did the Mr know your head had been turned for $9 ? Then the penny dropped (as we say in these here parts) Oh if only we had a Michaels over here. The boys are looking very handsome and grown up. Tempis fugit. Bloomin predictive text. That should be tempUs fugit!!! I bet brunch was lovely. Your cards are beautiful. Very nice to hear all your things went on to nice new homes to get some more love. That sentiment is too funny! Love the pop of color in your mostly black and white card! Yes, Washi tape is perfect for making quick cards but then why do I usually forget to use it??? The big grins the three of you are wearing in that photo makes me smile, too! It's always so much fun to visit your blog, Darnell! 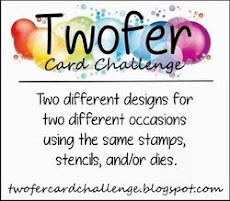 Looks like you had a blast playing with your new Die-Namimcs and I am LOVING your dots and stripes on your challenge card...NBUS Washi tape? WOW! I love the pop of red on your balloons, too...not to mention your fabulous sentiment! So glad you had a lovely Mother's Day! Gosh, your grandsons get more handsome every day!!! Ooh, love the b/w/red card with the spotty dotty washi! And your QACAS angled die-cut cards are a great way to use up pp. I'm attacking my paper mountain one sheet at a time - very slow progress! Fab photo of you with Adam and Henry - they're growing so fast! The boys are so handsome and really growing up way too fast!